As human resources continue to evolve and employee benefits lead the way, Marketplace Update North Carolina is designed to assist brokers optimize client relations and service. Regardless of practice specialty, as a consultative advisor it is important to be aware of the compliance issues impacting employers in 2018 and how to mitigate exposure. 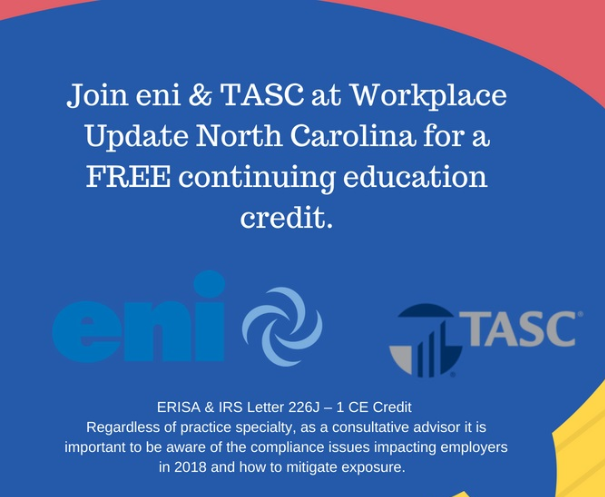 • ERISA compliance challenges for employers of all sizes. • Disclosure/reporting requirements, updated fines/penalties as well as Department of Labor investigations. • the ACA, and enforcement of the Employer Shared Responsibility Payment (ESRP). • Why so many employers are getting the letter, how to respond and what to make of the responses from the Internal Revenue Service. Additional HR topics to include integrating employee beneﬁts based on client needs.